This was a travertine floor in a home in Novato that had some pretty deep scratches and etch marks all over the floor. 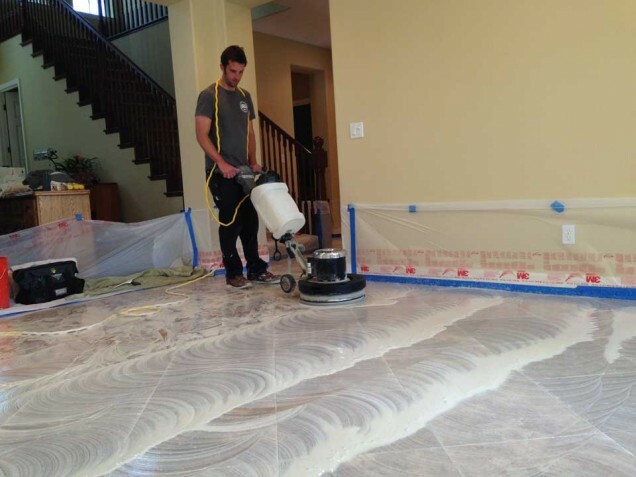 The owners were putting the house up for sale and wanted to increase the value of the home by making the floors look perfect. The only way to remove scratches or surface stains is with the polishing process. Diamond abrasive pads are used to remove a slight layer of the surface of the stone. Different grit levels are used to achieve the desired sheen the customer is looking for. We went up to the 3rd step (1800 grit level) on this travertine polishing service which brought the floor to a pretty nice sheen. We were able to remove all the scratches and etch marks with the polishing process. The owners were extremely happy with the results. We sealed the floor with a solvent based penetrating sealer to help protect the travertine floors.